In another article, I addressed the two-jointed muscles (TJM) of the lower body. This discussion will focus on the TJM of the arms: the biceps and triceps. So, here is a quick tutorial on two-jointed muscles: As the name implies, a TJM crosses two joints and performs dual functions. In example, it could be a flexor at one end and either a flexor or an extensor at the other end. Recalling the lower body, the gastrocnemius (calf) muscle is two-jointed because it not only plantar flexes the ankle (i.e., heel raise), but it also assists with knee flexion (i.e., leg curls). The biceps. To train them, you simply do bicep curls, right? Not so fast, my friend. There is much more to the biceps than elbow flexion. In fact, they are considered "tri-articulate” in that they function over three joints. Did you know there is a bicep muscle that actually assists in shoulder flexion and forearm supination (turning the palm of the hand up)? The biceps brachii has both a long head and short head. The long head originates at the scapula, more specifically at the supraglenoid tubercle of the scapula. It inserts on the radius bone of the forearm, more specifically the tuberosity of the radius. The short head also originates at the scapula, more specifically at the apex of the coracoid process of the scapula. It also inserts on the radius bone of the forearm. With your right arm extended and forearm pronated (facing down), place you left hand over the right biceps. Flex (curl) the right forearm completely. With the arm completely flexed, supinate the forearm so your palm now faces you. Wow, did you feel that? The supination function of the biceps brachii completely contracts the muscle. This has implications on proper exercise selection to be discussed later. The short head of the biceps brachii also assists with horizontal flexion of the upper arm if it is medially rotated. That is, it moves the upper arm to the front from a side raise position if the thumb is turned in/elbow pointed out. This action would be similar to dumbbell chest flies with the upper arms rotated inward. As odd as that seems, it shows the intricacies of the skeletal-muscle system and why it is virtually impossible to isolate one specific muscle group. Let's go a bit deeper on this issue, literally. There are four more muscles that need to be discussed relative to this biceps thing: the brachialis, brachioradialis, supinator, and pronator teres. The brachialis muscle originates at the humerus, more specifically at the lower one-half of the anterior surface. It inserts on the ulna bone of the forearm, more specifically at the tuberosity of the ulna. Although it is a single joint muscle, it effects what goes on in training. The brachialis is solely a forearm flexor. No forearm pronation nor supination. Bend the arm and that's it. The brachioradialis muscle also originates at the humerus, more specifically the proximal two-thirds of the lateral supracondylar ridge of the humerus. It inserts at the radius bone of the forearm, more specifically at the lateral side of the base of the styloid process of the radius. The brachioradialis flexes the forearm and - believe it or not - pronates (palm down) and supinates (palm up) the forearm depending on its position. When the forearm is pronated, it tends to supinate during forearm flexion. When more supinated, it tends to pronate during forearm flexion. Confused? Hang on, simplification is forthcoming. The supinator muscle originates at the humerus, radius, and ulna, more specifically the lateral epicondyle of the humerus, the radial collateral ligament of radius, and the supinator crest of ulna. It inserts at the radius, more specifically at the lateral surface of upper one-third of body of radius and covers part of the anterior and posterior surfaces. The supinator does just that: it supinates the forearm. The last muscle of issue is the pronator teres. It originates at the humerus and ulna, more specifically at the humeral head above medial epicondyle of humerus and the medial side of the coronoid process of the ulnar head. It inserts at the radius, more specifically at the middle one-third of the lateral surface of radius. The pronator teres offers two actions: forearm pronation and forearm flexion. What exercises, then, give you more bang for the buck when attacking the front side of the upper arm? Seated on an incline bench with the arms completely extended downward (taken out of flexion) and the forearms pronated (taken out of supination). Curl the dumbbells upward, then supinate the forearms as full elbow flexion occurs. Maintain the upper arms perpendicular to the ground during the curling movement. This maximizes the load placed on the biceps brachii, brachialis, brachioradialis, and supinator. Click here for a demo. Flexing the forearm while maintaining a pronated position hits the brachialis, brachioradialis, and pronator teres, sans help from the biceps brachii and supinator. Click here for a demo. The triceps brachii has three heads: long, lateral, and medial. The long head (a TJM) originates at the scapula, more specifically at the infraglenoid tubercle of the scapula. The lateral head originates at upper arm, more specifically at the superior one-half of the posterior lateral surface of the humerus. The medial head originates at the upper arm, more specifically at the inferior two-thirds of the posterior surface of the humerus. All three heads insert at the forearm ulna bone, more specifically at the supra posterior surface of the olecranon process of the ulna and deep fascia of the forearm. 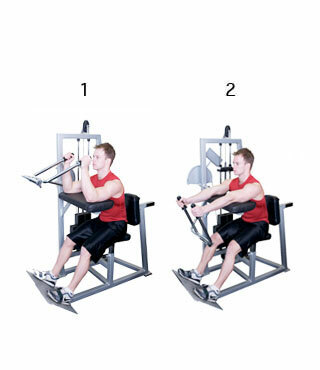 All three place the upper arm in an abducted and flexed position, necessary for complete triceps long head involvement. Triceps pushdowns on a high pulley device are acceptable provided the upper arm is stabilized out in front of the body (removed from the triceps brachii extension role). A note on the infamous triceps kickback exercise as seen in many women's fitness magazine programs: the upper arm is extended backward while forearm extension is attempted. The TJM triceps brachii long head is working at both ends here, rendering it ineffective. This is analogous to swimming upstream against a current. Expunge that exercise from your routine immediately. They both address the long head of the triceps in their role as humerus extenders due to the fact the forearm is flexed thus maximizing that function. Traditionally thought of as pulling bicep and back-only exercises, the effectiveness of these movements further reveals the beauty and complexity of the human musculoskeletal system.